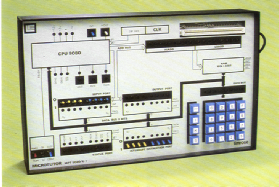 The Microprocessor Trainers is housed in a sturdy metal case, with a large clear front panel as shown ion the right. The front panel has more than 40 LEDs and numerous switches to display all important signals – including the 16-bit address bus, 8-bit data bus, memory output and CPU Status Signals. You can actually watch each “machine cycle” as your instructions are executed. The built-in Input Port can read external signals and the Output Port drive devices such as motors and buzzers with little or no additional hardware. TTL-compatible External Connections for interfacing circuits. The Limrose Microprocessr Trainer is ideal for newcomers to this exciting new technology. This trainer uses the same architecture as used by all modern Intel computers and microprocessors as used in Windows PC.. The instruction set is “upward compatible” with Intel 486 and other Intel microprocessors. “I can’t tell you how pleased I am with the Microtutor” - ex-Director, Racal Electronics. “… a superior teaching aid for microprocessors has yet to be made available. Excellent.” – Post Office College of Engineering (UK). Single cycle, Single Instruction and Continuous modes. Mode Control Switches for Load/Run, Single Instruction, Single Step and Continuous Modes. 8-bit Input Port, Switches or external TTL-compatible inputs via 1mm pins.